https://www.emptywheel.net/wp-content/uploads/2016/11/Screen-Shot-2016-11-04-at-4.49.48-PM.png 272 376 emptywheel https://www.emptywheel.net/wp-content/uploads/2016/07/Logo-Web.png emptywheel2016-11-04 17:31:052016-11-04 17:47:07Threat Level Orange! Election Week Plot! Gobsmacking. And evidence that those who intend to vote Trump, claiming to be outraged because the “elite” is running a corrupt system, are barking up the wrong tree. Given that Republicans will continue to give Comey, Brennan et al cover, is it fair to assume that the FBI cesspool will never be drained? Can we just build a wall around the Hoover building? It will be the best wall. Tremendous. Actually, Comey will pay for it. 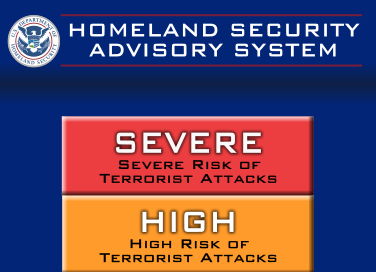 I’m reminded of Tom Ridge’s color coded threat levels that conveniently went up at election time. I also remember several Bushies noising about delaying the 2004 election because of the terror threat. Since I know there are Bushies burrowed into the government at all levels (it was a deliberate policy to prevent backtracking) this is a tried and true playbook. With someone other that Trump who is bat-bleep crazy, it might have worked. Speaking of orange, agent orange. To whom is the FBI accountable and why isn’t something being done to restrain their behaviour? There’s two plots, their operatives have been spotted in all 50 states plus the District of Columbia. One is code named “Donald” the other “Hillary”. The first is code Orange, the other code Blonde. One will execute for sure next Tuesday. The FBI has seized 650,000 emails from the second in command of one of the terror campaigns. Drone strikes are expected over the weekend, one code named “Melania” and the other “Bill”. It has just been determined that the threat level code names are themselves just “covers”. The actual underlying, even more alarming, geriatric codes are Bald and Gray. 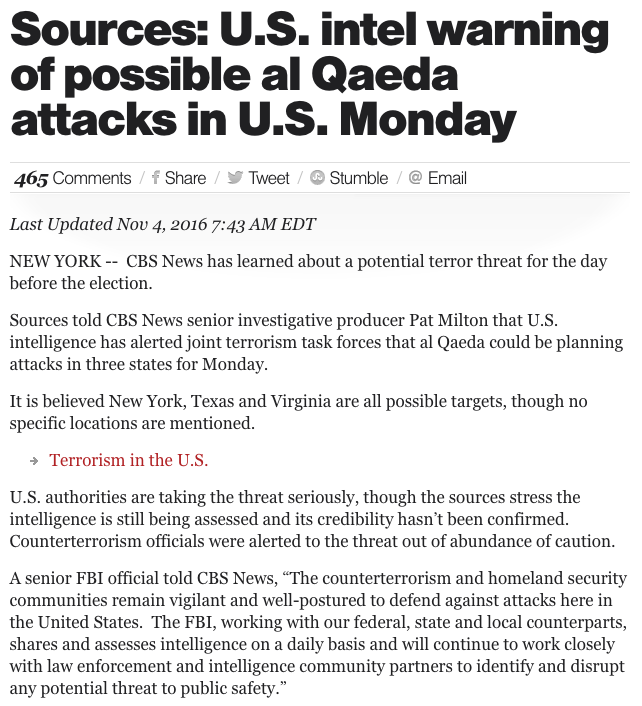 Despite the ‘Little Boy Who Cried Wolf’ record of the U.S. Terror Alert system, I would give the day-before-election prediction a possibly real possibility rating. I suspect a possibility possibly from an unexpected, from a saboteur, source, for pure disruption and with vote-swaying intention, but with not a lot of focus. Something similar to the Black Church Arson with “Vote Trump” graffiti tagging, which is bizarre and more confusing than message-sending, since it is doofy from both a pro-Trump and a pro-Klan perspective. The mix makes so little sense it leaves the doofiest whackos of both those factions scratching their heads and wondering why anyone of theirs would do that. The combination is the kind of over-do a saboteur would be more likely to screw up his effort doing, attempting to get maximum mileage by combining his target antagonists. Anyone doubt that this is a provocation aimed at getting out the vote? As for Comey and Brennan they are both Obama appointees- it is difficult to see how Trump can be blamed for either one of them. If you hafta make apple pie and all you have are bad apples, you still hafta make the pie! It’s as ‘Murican as rotten apple pie. The only terrorists the Clintonites see are the ones in blue windbreakers waving arrest warrants with Red Queen printed boldly on the front. 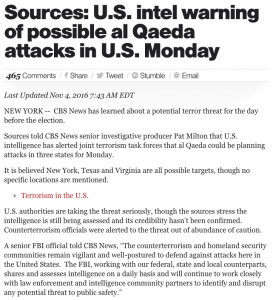 The FBI, according to them, is a hotbed of Jihadist terror determined to disrupt their sacred and rigged, voting rituals. The Queen’s collective is throwing sandbags, barn doors and kitchen sinks desperately trying to deflect the growing tide of justice that threatens to swamp the royal barge as it floats on a river of denial headed to DC.